Pancit! It’s the answer you’ve been looking for. In those desperate moments of last minute dinner plans, here is a recipe that I come back to time after time. It is so good. Like, really good. Like, make little noises of happiness while you eat it good. I don’t know how it happens—the ingredient list is straightforward, but something happens in that pan that is unparalleled. And it’s a good thing it’s delicious because it makes enough food to feed my husband to get through most of a week. Don’t worry about following the amounts too closely, I just grab the ingredients needed and play it by ear eye. And those ingredients are cheap. What more could you ask for in a recipe? Oh yeah, did I mention it’s delicious? Place the rice noodles in a large bowl, and cover with warm water. When soft, drain, and set aside (you can let them sit while you prepare the rest of the ingredients and then drain when you are ready for them). Prepare the rice according to the package and allow to continue cooking while fixing the rest of the meal. In a large skillet, cook the chicken over medium-high heat until cooked through and juicy, and cut into small pieces. Stir in cabbage, carrots, and soy sauce. Cook until cabbage begins to soften. Toss in the drained noodles and cook until heated through, stirring constantly. 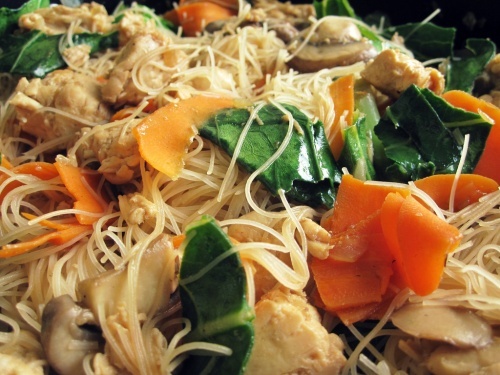 Serve pancit over the white rice and enjoy! Place the rice noodles in a large bowl, and cover with warm water. When soft, drain, and set aside. Heat oil in a wok or large skillet over medium heat. Saute onion and garlic until soft. Stir in chicken cabbage, carrots and soy sauce. Cook until cabbage begins to soften. Toss in noodles, and cook until heated through, stirring constantly. Transfer pancit to a serving dish and garnish with quartered lemons.